The Buttoned-Up HOH competition was shown on the feeds. Incidentally, it aired at the same time as the east coast eviction episode. It started early, and there was a technical difficulty with Johnny’s button. Initially, I thought this was an accidental feeds leak, but learned that BB meant to show it online. The temptation competition is a fan favorite, and it aired last year on the feeds, but this year it aired at the same time as the East coast eviction episode. The first temptation was a pizza party, and there were no takers. Paras has hyperhidrosis, which causes her palms to sweat excessively. She knew this wasn’t her comp, so when the second temptation of $1,000 was announced, she took it. She has thrown every competition so playing both sides isn’t obvious. Although, many houseguests have caught on. Paras realizes she’s playing a floater game. Sometimes I find Paras to be entertaining; like when she talks to feeders. However, she often tries to be the center of attention, whines loudly when she isn’t and is admittedly boogey. Ryan accidentally takes his finger off the button when he is trying to switch hands. Maddy does the same thing, and then cries hysterically, saying that comp was her’s to win. She is so overly emotional. When a week of safety is the temptation, Derek takes it. The next temptation is a phone call from home. Will is dying to hear from his son, and Kaela tells him, Olivia and Johnny that they are safe with her. So, Will takes the phone call from home. Moments later, Erica announces that the houseguests remaining (Johnny, Kaela and Liv) must now only use 1 hand for the remainder of the comp. Meanwhile, Kaela is telling them that they are safe. Johnny ‘accidentally’ switches hands. Once Johnny is down, Erica announces that there will be no more temptations. Since Liv and Erica have both proven their loyalty by not nominating Kaela and Derek, the Liv/Ali vs. Derek/Kaela beef seems to have been squashed, and Liv gives the HOH to Kaela as a show of good faith. Kaela winning HOH has sent the houseguests scrambling because they don’t know what she is going to do. She asks each person if they said they were targeting her and Derek. She told Erica, Liv and Ali that they are safe this week. The members of The 6 alliance tossed out the names of the others as who threw out Daela’s names. Kaela made Johnny sweat, but finally said that she believes him that he didn’t throw their names out, and he is safe this week. She is bullshitting him, hoping for an opportunity to backdoor him. Kaela even said that since everyone wanted to keep Ryan so bad last week, she isn’t nominating him. She was going to nominate Maddy and Will, but Paras got in a conversation with her, and got her to change the nominations last minute. Kaela even told Will and Maddy that they were going on the block. The fact that no one has caught onto Paras’ power of persuasion is ridiculous, especially when Kaela was doubting Paras over the last few weeks. During the nomination ceremony, Kaela called Ryan a manipulative liar. Afterwards, he apparently called Maddy out for being the one that spearheaded him changing targets from Liv and Ali to Derek and Kaela because she said it would make people want to keep him over Merron. She did do that, and she exploded on Ryan after the nomination ceremony. Of course, she cried again. Maddy=Canada’s Big Meech. Will is super pissed that he is nominated, and that the reason he is nominated is because he’s a pawn. I think he considers himself a big target, so being called a pawn insults his ego. The POV involved some type of maze and a puzzle. It was played in rounds. In the final round, it was Johnny vs. Ryan. It was really close, but Johnny pulled out the win. While Johnny wants to use the POV to pull Will down, the house is on board to take Ryan out this week. Johnny talks with the houseguests to get a temperature on the house to make sure that Will is safe if he leaves him on the block. Ali and Liv decide to throw Johnny under the bus for talking about taking out one of Daela next week. Erica has also been on board with Johnny’s line of thinking. Both Daela and Ali/Liv have been talking about taking each other in the triple. The word triple has been thrown around so much this week, it’s making watching the feeds annoying. Ali and Liv are down for taking the shot at Daela next week but decided to throw Johnny out as the potential target for next week in case Derek wins. They threw out Erica’s name to a lesser extent. Johnny goes to talk to Kaela about whether to use the veto. In the back of Kaela’s mind, she is thinking that she might backdoor Erica if he uses the veto, but she is telling Johnny that she would put up Maddy or Paras. Johnny talks to her for a long time and she gets him to in a round about way, throw out the possibility of getting Ali out this week. 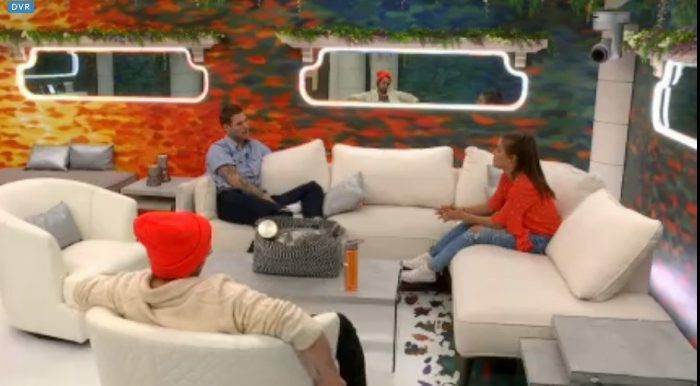 Johnny tells her that Maddy may go home next to Ryan, and that if she puts up a target that she’s had since the beginning that she at least gets out a target. Kaela spins the conversation she had with Johnny into him throwing Ali under the bus. Now, Ali, Liv, Derek and Kaela are saying that they will never put each other up and will take Johnny out the first chance they get. They don’t mind bringing Erica to final 5, but if she makes it to final 2 with any of them, Erica is going to win. Because of her conversations this week, Kaela believes that Johnny is firmly aligned with the other side of the house way more than with their side. What she doesn’t know is that Ali and Liv are also aligned with the other side of the house in the alliance of 6. With the twist of voting to save a nominee, THIS ISN’T THE WEEK TO USE IT, Canada. Save it for next week because Will isn’t going home. It’s Ryan, and he’s not that good on feeds. I suppose you could take Ryan off the block to blow up Kaela’s HOH, but then she is going to name Johnny or Erica as the replacement nom. She already had major HOHitis this week, relishing in the fact that she had everyone squirming. Don’t give her any more power or your favorite may end up going home! Daela=boring feeds. Before you go, please comment below. What do you think of the season so far and the twist? Enjoy Eric’s nightly comedic shows on YouNow with BBCAN6 tea served piping hot. Former Big Brother houseguests will join him during the season. Make sure to FAN him on YouNow. 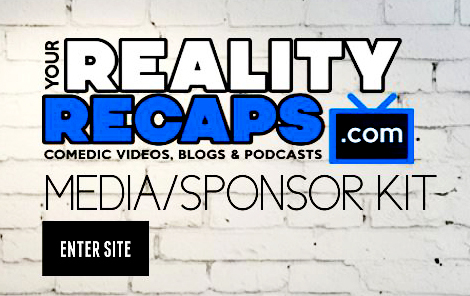 Follow him on Twitter @RealityRecaps. You can follow me @rebeccakayj. If you ever have any complaints or issues, contact @YRR_Cust_Svc. There is going to be SO MUCH to keep up with this season! So make sure you follow us on TWITTER and check our BBCAN page daily for updates! AND DON’T FORGET… we are doing YouNow shows all season when the feeds go down so make sure you BECOME A FAN there! We will of course be doing recap shows and interviews too! Whenever something goes down on the feeds we will get on social media via YouNow or Twitter to discuss LIVE with you! We will have recap blogs after every episode and live tweeting during them! Still want more? Then become a Patreon for EXCLUSIVE content, giveaways, access to reality stars and become a member of the private Patreon group! So in order to help support us in our coverage of Big Brother this season please consider: Getting the live feeds from us here or becoming a Patreon, making a pay pal donation. Of course we get it, money can be tight… so if you’d like to help us for free then be sure to subscribe to our shows in YouTube, iTunes, YouNow, and thumbs up and give us a nice review (we want to win a podcast award this year). Also following us on your favorite social media site (by clicking the icons in the side bar) and then sharing our content there is also a great way to help as well! We can’t thank you enough for enjoying our shows these last 8 years,hopefully with your support we can continue to do them for the rest of the year. You could also see what specific help we need by checking out our HELP US page HERE! We can’t thank you enough for all your support! We love you all!